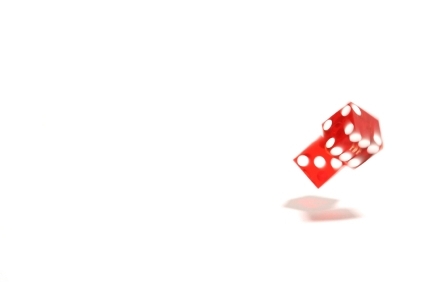 Risk and ambiguity impact how and whether people make decisions. Research (e.g., Brand, Labudda, & Markowitsch, 2006; Qi, 2006) has shown that, in risky situations, people make decisions much differently than in ambiguous situations. Very interestingly, Qi has shown that when consumers are given the choice between making a decision based on risk or based on ambiguity of information, consumers will choose risk over ambiguity. 1. When faced with a risky decision or an ambiguous decision, consumers choose risk. 2. When coping with making a risky decision, consumers require more proof about a product/service to help make a decision than in non-risky situations. So you’re on a dating site, and you’re sorting through a big ol’ result list of potential matches. That’s a lot of info to process when making a decision. And, of course, you want to make the right decision. When in the presence of multiple stimuli and when you’ve got your romantic future on the line, which options do you immediately eliminate? …Did I hear “the ones without photos”? What you’re witnessing is The Ugly Mug Principle. Even if you’re not the hottest guy, you’ll still have a better chance of a woman checking you out if you show a photo of your ‘ugly mug’ than no photo at all. Why? Because when faced with a risky decision or an ambiguous decision, consumers choose risk. Show your product’s flaws instead of glossing over the issue or pretending it’s not there. 1. Simple solution: You prove that, in spite of your shortcomings, you’re not a risk. With photos of you in the O.R. With photos of you watching your nieces dance in The Nutcracker. 2. Better solution: You get others to prove it for you. 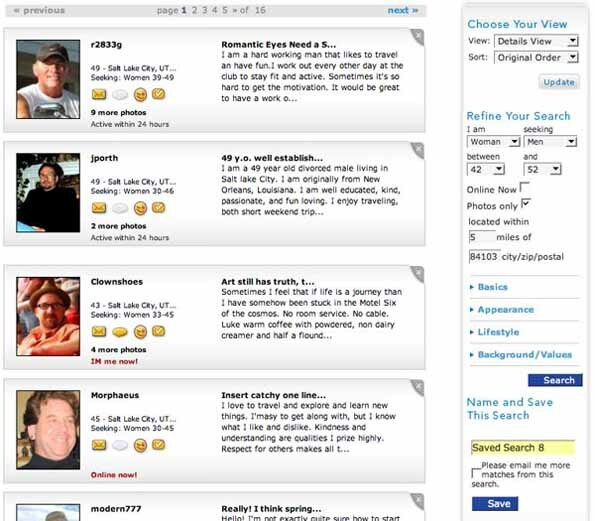 This is where sites like eHarmony, Match.com and PlentyOfFish have room to grow by adding in reputation management tools or links to recommendations on LinkedIn, Naymz, etc. Why? Because when dealing with risk, consumers require more proof of the worth of a product than in non-risky situations. 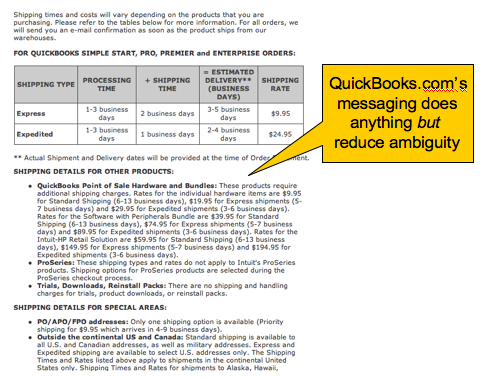 When you’re telling users about shipping costs, you need to place those messages strategically. The point in the conversion funnel at which you reduce ambiguity around shipping costs will impact how much further a user goes down the funnel. So you can show on your home page that you charge $25 to ship. Or you can show it on a product detail page. Or you can show it in the cart. Or the catalog. 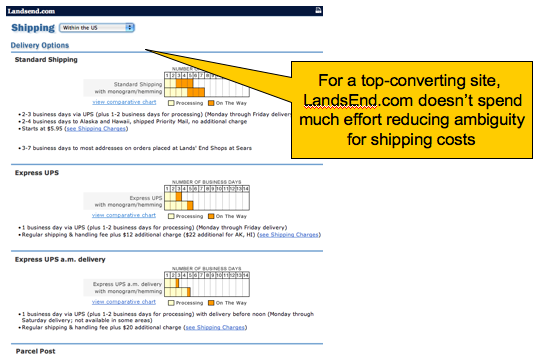 It’s definitely worth a test on your site to see the impact of shipping messaging in various places in the conversion funnel. Let’s look to some random examples quickly to see who’s doing what where. We’ve seen that even the highest-converting sites position their shipping costs in differing places, and that those etailers with a better shipping story to tell (e.g., low-cost, flat-rate, free) tend to place those shipping messages earlier in the conversion funnel. …and, as we always advocate, test it.